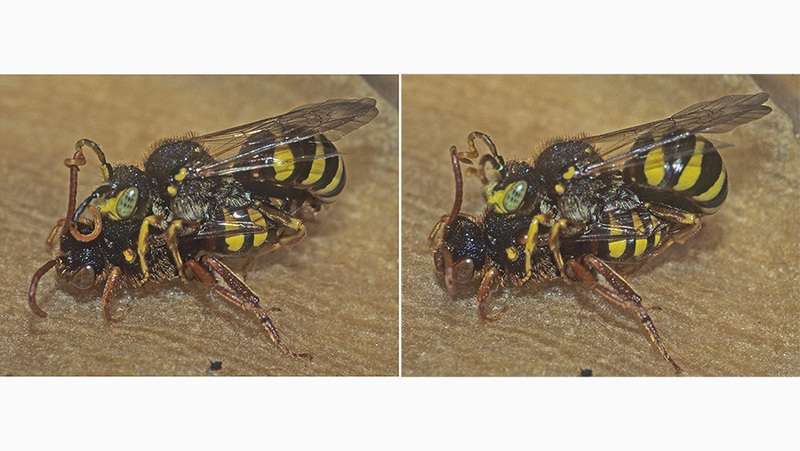 Insertion phase of copulation in a couple of the species Nomada flavoguttata. Note the male’s antennae spirally entangling the female’s. the female’s during copulation, thus transferring pheromones. Even though such behaviour is relatively common in Hymenoptera, this is the first known record for the genus Nomada. The courtship in Nomada cuckoo bee starts with the ‘swarming’ of males at willow shrubs and gooseberry or their patrolling in groups with males of the Andrena or Melitta species that will “foster” their offspring. Two males of the species Nomada flavoguttata patrolling at a blossom of a common dandelion. There is no aggression among the males. They were observed to rub their bellies and heads against the grass, in order to leave sexual pheromones, thus marking the “dating spot” for potential mates.